Cindy’s simple solution to cords and chargers out of control and either tangled on the desk top or snarled in the drawer. A great use for the over-abundance of plastic containers wasting space in your kitchen. I’ve done something similar by putting cords, chargers and instruction manuals for each in its own ziplock bag and labeling them. Sure makes life easier! Having things organized and not getting tangled does make life easier. I have all my remotes labeled too. We have one we never use for a stereo, but we don’t want to get rid of it. If we just put it in the remote basket unlabeled, how long do you think it would be before we had no idea what it was for? Cindy, like you I label all the remotes as well, they all look so alike after a while. Perhaps I should place a very large label by the TV for the kids which says ‘Please Put Back Here’! Doesn’t it drive you mad when a remote goes missing just when your favourite program’s about to start?! I wondered if someone was going to ask me about that. It’s the cord for a rechargeable shock collar for our dog who barks excessively. And here I thought it was just a “dog collar”, non-technical type! Great idea! It took me 3 tries to find my phone charger today – all the chargers are dumped in one box – so I think I need to do this. Thanks! Thanks KarenV. I believe this is the first time you’ve commented here, so welcome! Good idea for cords and for using plastic containers. Kill 2 birds with one stone! I guess it would sound better to take care of two needs with one item. This would also be a good idea for a junk drawer. We put our pencils in a pencil box, sharpies in a pencil box, etc. so we know what is what. We got the containers a few years ago for 1-5 cents. It is nice to have things organized. Fantastic price on the pencil boxes! Good job. Spendwisemom, I would suggest that your drawer is not a junk drawer since it is organised and holds useful things. This is a great idea. 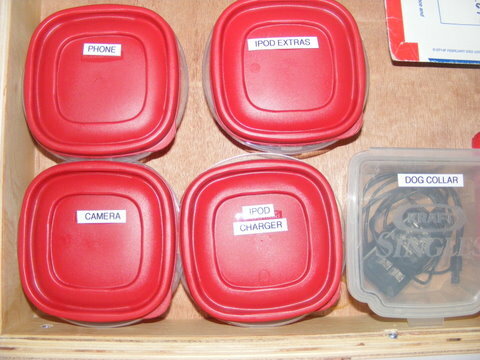 I’m all for using containers to organize things so that you know what they are for and where they are. Absolutely Deb J. In this case, I think having containers with lids is crucial because otherwise the cords tend to curl out of their cubby and next thing you know, it’s a mess again. I absolutely LOVE the Kraft cheese box. It was passed to me by a friend. Seems unnecessary for cheese, but with its hinged lid, it’s a real winner for storing items. I like my grilled cheese sandwiches with Kraft American, so I tried to buy myself cheese in the same container, but sadly, they don’t make it any more. I should say, it’s sad for my own selfish purposes that they don’t make the cheese box any more. From an environmental and clutter point of view, a cheese box like that is completely unnecessary. I know exactly what you mean…I miss those little boxes. Cindy, You GO GIRL! I love that idea! I have a stack of containers from take out restaurants. I threw away a few, but the rest are still taking up space. I couldn’t part with them because they were useful. Meanwhile, elsewhere in the house, nests of wires grow and multiply. Now that I’m storing more and more leftovers in glass, they sit unused. Not much longer! Oh thank you! I feel like I should do a pirouette and a bow. Use ’em up JanetW! This is a great idea! I have a half-dozen of those very containers in my kitchen cupboard. I need to buy a labeller for that uniform look, though! Thank you Susan, but don’t let the lack of a labeler stop you. You can use a piece of masking or art tape and your prettiest or most decorative handwriting and make a label that way. Or you can use a Sharpie and write directly on the container, or you can label or decorate a piece of paper and attach the paper with clear tape. Also I believe you have not commented here before, so welcome to our happy, decluttering club! Super idea Cindy! I got rid of all these types of containers, except for the three I actually use for leftovers. My phone charger lives in a pretty container by day when not in use at night. I have a large Lowpro camera bag that holds my two cameras (DSLR and P&S), lens, manuals, battery chargers, cords, etc. Before I was organized, my camera equipment was scattered all over. Now everything is nicely contained in one place. I have no other cords to contain. Sounds like you already have your cords under control. Good job. Cindy, I love this storage idea, and wonder why I didn’t think of something like this myself. I don’t have any of those plastic storage containers in my cupboards any more (have since switched to trying to store in glass as often as possible instead), but you’ve got me thinking about alternatives now. My desk drawer is overflowing with various cords, and it’s a pain in the neck to have to get into it. I’m sure you’ll come up with something. I wonder what it will be. I keep my Eee-netbook charger in a carry-tin that fits it perfectly, with my USB-iPod cord (to update the songs/audiobooks on it) in the same box, but they never get tangled together. I don’t think I ever got an iPod wall-charger and it “lives” in the cheap speaker/charger I got for the kitchen. I have a retractable USB phone charger (was only about £2) and mini-solar charger (Pico?) in a small velvet drawstring bag (when it’s not charging), which also has a short mini-USB cord (to charge the charger when there’s no sun) and have 1 spare USB phone charger next to the PC in a mug that says “Is it Friday Yet?” that also stores a couple of other rarely used small things (like a couple of paperclips). I freecycle any old chargers after I send my old phones to charity (and the last time I did that was about 2-years ago as my htc is standing the test of time rather well *I hope I don’t jinx it! *) and I can’t think what other cords people could possibly need… I’ve recently added my digi-camera (and cord) to the “to e-bay” pile, as I never use it – I just take photos on my phone! So they don’t get tangled. Which will probably take up less space than all the boxes. I’m pretty sure you can get some tabs that you can write on, but as I have so few, it seems pointless. @ Colleen – you’re a total inspiration! 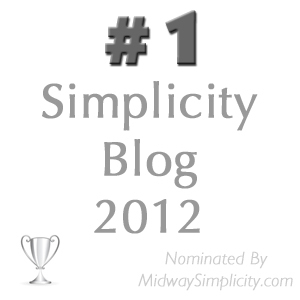 Oops – that was a really long post – sorry! Oh this is perfekt (perfect). (Colleen, I like the ‘k’ better!!!). Like the first commentor above (hi Juhli), I do the plastic bag thing with all the product extras and instructions inside, then labeled w/ marker outside of the bag. I like Cindy’s use of the containers, but not all our stuff will fit suitably in those (although it would ‘store’ easier cause they all fit together on a shelf). Oh well, at least having it organized has helped tremendously in finding stuff on a dime without having to waist extra time. “Honey, have you seen the butter?”, says the husband as he stands at the refrig with the door open and all that is in the refrig is butter, and tons of it, all labeled, too! I saw that years ago on a greeting card and still to this day love it!!!! Annabelle, I love the butter thing! My husband used to be that man, but he has gotten much better over the years! Cindy, I like your simple solution. Mine is a bit different – I keep the cords at the point of use. The camera cord for downloading pictures to the computer is by the computer. My phone charger and camera battery charger are beside the outlet in my paperwork area, and my husband’s phone charger is kept by the outlet where he charges his phone in his paperwork area. Sadly (or maybe not), that is all the things we have that need charging. We are not a high tech bunch 🙂 It does make it easier to keep track of them though.